The Notebook Cover from Aker is an effective and economic method for protecting valuable field notes taken on the job. 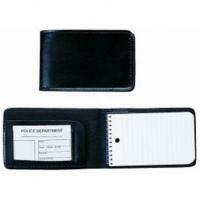 Effective police work requires taking frequent notes and recording pertinent details. As these notes become more critical, users need to ensure they stay dry and protected from water, the elements and other forms of danger. The leather cover produced by Aker provides this all-environment protection that professionals need, plus it looks impressive. An integrated plastic insert is built into the cover for secure storage of business cards and IDs. The cover is available for both 3 x 5 inch and 4 x 7 inch notebooks. Very happy with the size and durability of this cover. Finally something that fits our FI cards.